Paris’ Christmas markets are among the things that make the holiday special. The markets are found all over the city from the Notre Dame to the Place Saint Sulpice to the Hotel de Ville. But the biggest (10,000 meters) and most diversified market (200 stalls) is found at Paris’ La Défense. The earliest Christmas markets date back to the late middle ages and have their origin in Germany. The Dresden “Striezelmarkt” is said to be the oldest Christmas market and was first held in the 15th century. The Bautzen Christmas market and the Vienna “December Market” are supposed to be even older dating back to the 13th century. It was in 1570 when the Christmas market tradition found its way into Alsace, France’s easternmost region bordering Germany. A few years ago several major European cities started their own Christmas markets. Some of those Christmas markets attempt to follow the German tradition by inviting German traders and offering German goods. Popular features of German-style markets are Nussknacker (carved nutcrackers), Räuchermännchen (Christmas smoking men), Gebrannte Mandeln (candied, toasted almonds), Lebkuchen and Magenbrot (both forms of soft gingerbread), Christstollen (a sort of egg bread with candied fruit), German sausages and Glühwein (hot mulled wine). In contrast to the centuries-old Christmas markets in the Alsace region (in Strasbourg, Sélestat or Colmar) which clearly show a German influence, Parisian Christmas markets have established a tradition of their own. La Magie de Noel aux Tuileries is the newest addition to the Paris Christmas market scene. With a carnival atmosphere the market features the usual trinket stands along with rides, Ferris Wheel, ice skating rink and “Thriller” haunted house . Open to January 06, 2019. Located in the Tuillerie Garden along the rue Rivoli. Paris’ biggest Christmas market located at La Defense features such French favorites as Foie Gras and Magret de Canard Séché from the Périgord, Jambon Sec from Bayonne, Confit de Canard from Gascogne and Cassoulet from Languedoc. For more “traditional” German-style foods stop by the booth from the Alsace region and try some Choucroute and Macarons. Lovers of German sausages or Glühwein will enjoy sausages from Toulouse and Strasbourg with vin chaud traditionnel. More exotic Christmas tastes will be found at a couple of booths from the French overseas departments such as La Réunion, Martinique or Guadeloupe. Here you can taste some local specialties such as Rougail Saucisse, Colombo de Poulet, Samoussas or Fruit Punch. In addition to food, the market features crafts people from all over the world offering exotic handmade gifts for last-minute shoppers. The Christmas Market at Saint Germain de Prés stretches about 25 stalls from place Sartre-Beauvoir up the blvd Saint Germain. It features traditional French favorites such as Les Macaroons, vin chaud, brioche, canelé and pain d’epices. There are quite a few stalls featuring Russian crafts such as nesting dolls and amber jewelry. The Christmas market at Saint Germain de Prés is open daily from 10 am until 8 pm. Place Sartre-Beauvoir, blvd Saint Germain. Metro: Saint Germain des Prés. Just a few blocks away at the Christmas Market at Saint Sulpice you can find more regional delicacies from around France including bières de Noel, saucisson sec. The kids will love the train where you can buy roasted chestnuts. This year there is also an enclosed (heated!) brochante in the place selling all the usual antiques and treasures. The Christmas market at Place Saint Sulpice is open daily from 10 am to 8 pm. Metro: Place Sainte-Sulpice. Climb the stairs out of the metro Abbesses into the midst of the Christmas Market at Place des Abbesses and you’ll find a market as bohemian as the neighborhood that features it. 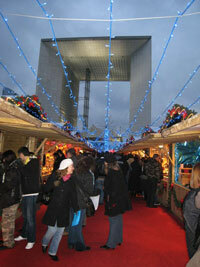 You will find the typical stalls selling vin chaud, roasted chestnuts and regional French products. There is a very well stocked stall featuring gastronomy from the mountains of Jura from bières de Noel, to honey, to saucisson aux noix. However, at this market you will find the majority of stalls selling hand-made gifts, even a stall featuring two new crafters each day. There are many artist selling hand-crafted jewelery including an artist selling necklaces, broaches and earrings made from real orchides, wooden toys, other novelty items and knit products. Père Noel makes several appearances at the market handing out gifts and goodies for the kids along with face painting and there is also a small enclosed carousel in the center of the place making this a very child-friendly little market. The Christmas Market at Place des Abbesses is open through the end of December daily from 11 am – 8 pm. Metro: Abbesses.